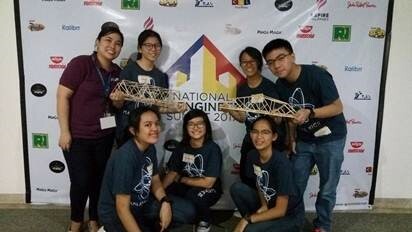 Malayan High School of Science (MHSS) students took part in the InCEthink High School Bridge Building Competition of the National Civil Engineering Summit (NCES) held last September 9 at the National Institute for Science and Mathematics Education Development at University of the Philippines Diliman. MHSS had two participating teams. Team A was composed of InCEthink veterans Shanen T. Arcedera, Myrtle Anne Marie G. Santos, and Peter Bryan Jose S. Sy, while Team B had InCEthink newcomers Hannah L. Lacaden, Mary Margareth Celline C. Pablo, and Audrey Gabrielle P. Tan. The students were accompanied by their coach, Ms. Anna Marie Sheryll A. Robles. According to Robles, aside from scheduled trainings, they also consulted an engineer to gauge and help them with strategies to strengthen the bridge. She added that the positivity and eagerness of the participants served as an advantage to the team. “Our team had a systematic way of building the bridge; each of the members had his or her own role in the construction,” Robles said. During the competition, each team was given a set of barbecue sticks and glue, which it would use to construct a bridge in a limited time of three hours. The constructed bridges were judged according to craftsmanship, design, and strength-to-weight ratio.